The 60 metre motor yacht Swan has been listed for sale by Frank Grzeszczak at IYC. An exquisite interior by Pierre-Yves Rochon is in dark wood joinery and all the structures are in place to install a guest elevator through the decks if desired. A large saloon has comfortable seating, a bar and entertainment centre along with a dining area. However, the emphasis on this yacht for sale is on enjoyment of the extensive deck areas with elegant al fresco entertainment and dining available on the vast aft deck, with steps down to the private beach club. 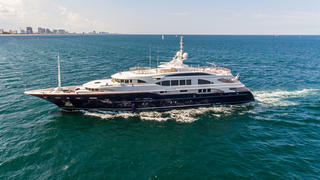 The superstructure has been specially strengthened to accept the weight of a touch and go helicopter and is topped by a vast sun deck offering an eight-person Jacuzzi, outdoor bar, gym and a selection of sun pads and sun loungers. As dusk falls, this area turns into a night club, employing a sophisticated sound system and disco lighting to keep guests dancing into the small hours. Twin 1,850hp MTU engines give her a range of 6,000 nautical miles at her cruising speed of 13.5 knots and she is fitted with Naiad zero speed stabilisers. Swan is asking $29.95 million.